While Southern Oregon might be known for hiking, fishing and Harry & David, there is one attraction you simply can’t miss when in Medford: The Craterian Ginger Rogers Theater. The more than 700 seat theater is located in downtown Medford, surrounded by many high-quality dining options and even is next to an urban city park. Let’s be honest, if you are visiting Southern Oregon to visit the Shakespeare Festival in Ashland, sometimes you need something a little different – to clean your pallet so to speak. During its season, the theater is basically a place where one-night road shows are performed, comedians make appearances and local performers are given a chance to produce shows and concerts. The availability of shows and concerts playing, depends largely on the time of year you visit. There are many benefits to seeing a show in Medford, first off, parking is plentiful in the downtown core after 6 p.m., and with the great historic downtown Medford, you can discover some restaurants and old buildings that you might otherwise have driven by. It is a very intimate venue, which adds to the charm of the old theater. In addition, money spent at the theater goes to a non-profit group that was created to enhance the cultural opportunities for the region. The theater was constructed in 1924 and was used for everything from vaudeville shows to movies during its heyday. Ginger Rogers, the actress and dancer, visited the theater 18 months after it opened in 1926, and found an affinity for Oregon – later buying a working ranch in 1940 with her mother Lela on the Rogue River near Shady Cove. However, in the 1970s, with multi-screen movie theaters being built and televisions in every home, the theater started to be neglected. The historically-registered building was given to the Rogue Valley Art Association in 1985. 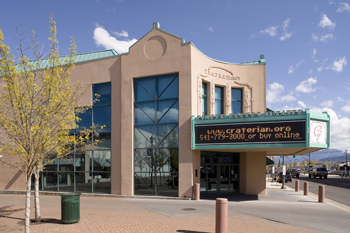 After a few years the building was given to the Craterian Performances Company, a nonprofit group that wanted the facility to become the heart of the downtown. “We do get a lot of community support for this theater, it’s one of the great things about our downtown,” said Sandy Martin, development and communications manager for the theater. In fact, the theater wouldn’t be in the shape it is now – in the summer of 2010 it was getting new carpeting – if it wasn’t for broad-based community support. During the mid-1980s the community raised $5.2 million for renovation and construction, and, yes, even Rogers was involved. She was also a part of the theater’s rebirth, giving another performance at the theater in 1993, two years before her death in 1995. In 1996 the construction started on the theater and was completed in 1997. Today it continues being the heart of downtown. About the Craterian Ginger Rogers Theater: The Craterian Ginger Rogers Theater is southern Oregon's state-of-the-art community performing arts center. The facility features excellent acoustics and sightlines, an impressive array of theatrical equipment and is operated by a professional staff. The auditorium is intimate and comfortable and seats just 732 patrons, yet the stage can accommodate large national concert, dance and theatrical tours. What to bring: Photography is not allowed in the theater, but different shows have different rules so make sure you ask the box office if it is OK to bring a camera when ordering tickets. Otherwise bring your willingness to have a good time. Tip: Members of the non-profit get first dibs on the tickets for one-night shows, but non-members are able to purchase tickets. If you know you are going to be in Southern Oregon far enough in advance, non-member ticket sales normally start around the end of July. Calling before then for a schedule of events is a good way to see if the theater will have something playing that you might be interested in. Season: If you are looking for one-night shows or Broadway titles, check the theater’s schedule between September and May. During the summer months local theater groups, workshops and other events are held at the historic venue. In addition, during the holidays there are Christmas concerts and even a fundraiser which features an amazing gingerbread house contest. Check the theater’s website for dates and times of shows at http://craterian.org. You can also reach the box office at 541-779-3000. Getting there: The address of the theater is 23 S. Central Ave, Medford, OR, for the GPS crowd. Otherwise if you are coming from northbound Interstate 5, take exit 27 and turn left onto Garfield following the signs to the “city center.” Turn right onto Highway 99 for about 1.7 miles and then turn left onto East Main Street for a couple of blocks then turn left onto S. Central Avenue and the theater is on the left. Coming from the north, exit southbound I-5 at exit 30, turn right onto Crater Lake Highway for about .4 miles, following the signs to “city center.” The highway will become Court Street and then turns into North Central Avenue. The theater is on the left after you cross Main Street, about two miles from the interstate.